1 Begin by getting your pan nice and hot over medium high heat. Pour some oil and just drop in the ground beef and Knorr Beef Broth Cubes. Now mix this continuously until the meat is golden brown. 2 Add Knorr Liquid Seasoning and cook for another 2 minutes or until the sauce is absorbed by the beef before adding the all-purpose cream and Dijon mustard. Make sure though that your fire is at low heat because you don’t want to make that cream curdle. 3 Gently toss the cooked pasta and grated cheese and that’s it! 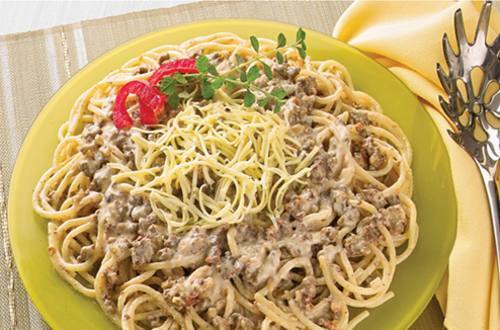 4 Creamy Mustard Pasta deserves a place in your stomach! You will definitely feel happy for it’s that good! But don’t keep all that happiness to yourself. Share and serve this recipe to others whom you love dearly and be their hero for the day.